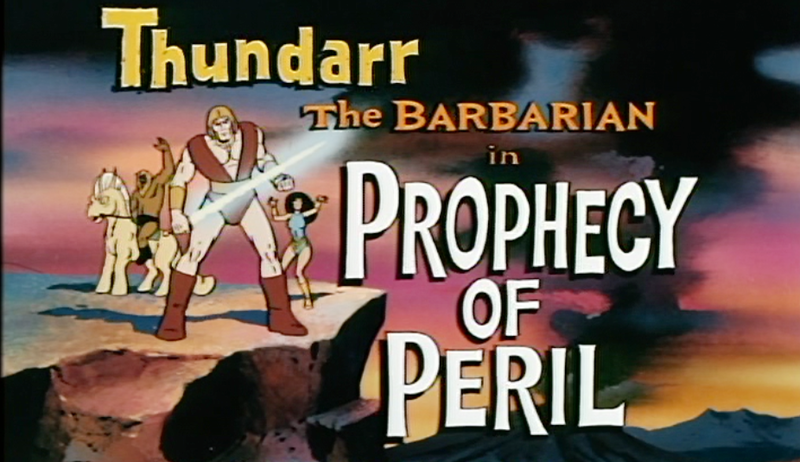 Saturday Morning Cult-TV Blogging: Thundarr the Barbarian (1980 - 1982): "Prophecy of Peril"
In “Prophecy of Evil,” Thundarr, Ookla and Ariel are locked in combat with a powerful wizard named Vashtar at his futuristic castle. 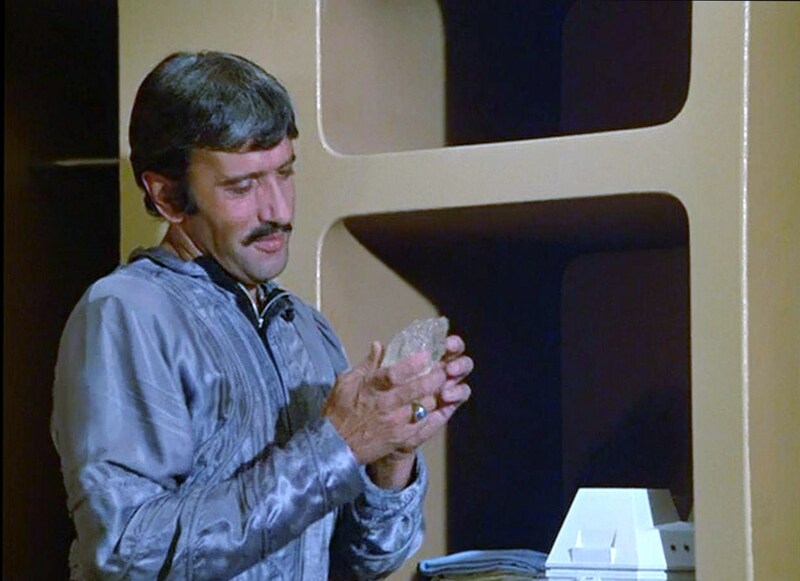 The heroes have captured a special crystal that Vashtar believes holds the key to his defeat. Suddenly, the fierce battle becomes a race against time as Thundarr attempts to recruit these three women, and Vashtar attempts to kill them. Vashtar travels back in time to the late 20th century and captures Valerie while Thundarr awakens a Mayan mummy, who becomes the beautiful Maya. Later, he successfully recruits Cynda, a warrior and misanthrope. 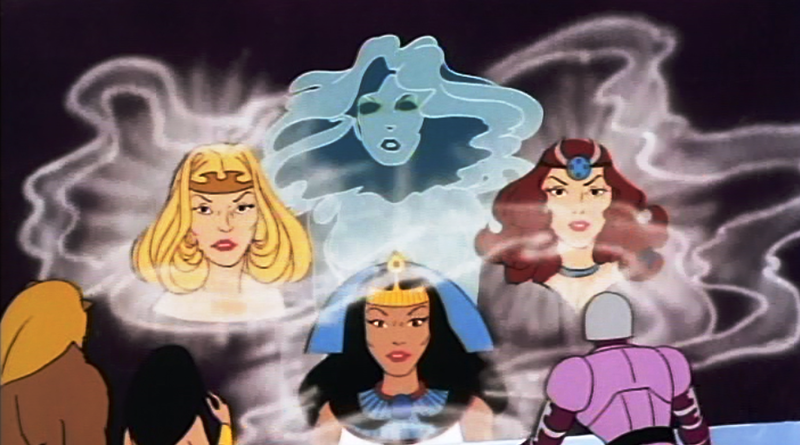 Together, the three women join forces with Thundarr to end the reign of Vashtar, but after the battle is won at the castle, all three women are zapped back to the 20th century. In some way, the final episode of Thundarr the Barbarian (1980 – 1982) feels more like a back-door pilot for a new Saturday morning series -- one featuring a team of Charlie’s Angels-like women warriors of various powers and abilities -- than it does a closing chapter for the actual program. No matter, “Prophecy of Peril” is fast paced, entertaining, and filled with dynamic female characters and a great villain, Vashtar. The story works, and the visuals -- from the castle and the crystal, to Vashtar’s air ship - are as dazzling as we have come to expect from this imaginative series. Still, I’m sad to see the series end with no resolution or change in format. It might have been cool for the program’s creators to pull a “Conan” here and end the series with Thundarr accepting the throne of a kingdom in need, for example. Also, there’s still a lot about this post-apocalyptic world -- and Thundarr, himself -- that it would be nice to explore. The series never depicted any stories about the hero’s span in captivity, as a slave. We know almost nothing about his family. The same is true of Ariel. In short, the series could have easily run for two or three more seasons assuming that it kept charging on with the inventive (and occasionally subversive…) visuals. Re-visiting Thundarr the Barbarian in 2014, I can say that I have come to appreciate the visuals very much. I love the series’ tactile sense of place, and its steadfast focus on revealing detailed, post-apocalyptic landscapes such as those in London, Manhattan, and Beverly Hills. I have also enjoyed how the series plays lightly (and humorously) with these settings, and makes commentary about them that is couched in a future world yet relevant to our own. 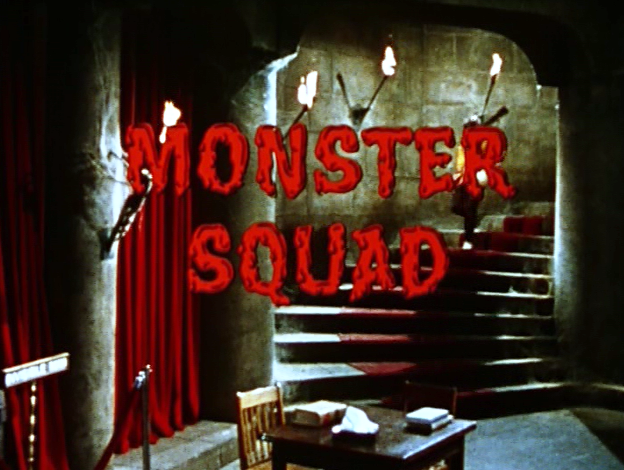 Saturday Morning Cult-TV Blogging: Monster Squad (1976): "The Astrologer"
In “The Astrologer,” The Monster Squad is shocked when an often-wrong prognosticator (Jonathan Harris) predicts that an Earthquake will strike the West Coast in less than twenty-four hours, separating California permanently from the body of the United States. Of all Monster Squad episodes thus far, “The Astrologer” just may be the worst, though “Music Man” remains in contention. 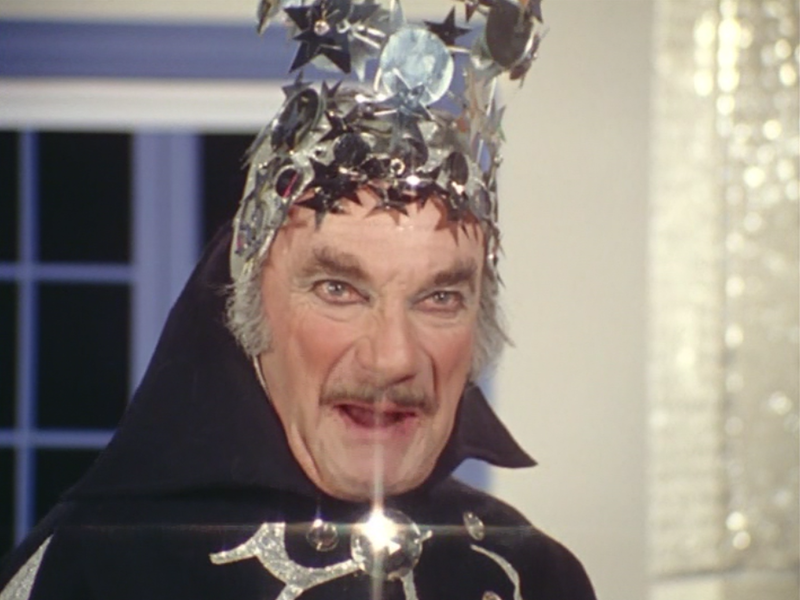 All the familiar elements from Batman are recycled mercilessly here, and the late Jonathan Harris (Dr. Smith on Lost in Space [1965 – 1968]) – in garish eye-make-up -- simply bellows all of his lines at the top of his lungs. Harris’s poorly-modulated performance reveals the nasty pitfall of the high camp approach. At some point, all the actors simply go so big that they can’t resist the temptation to out-shout one another. He who shouts loudest is the funniest, I suppose. Though “funniest” should be in air-quotes, because the material is amazingly unfunny, and proves even less funny when shouted at extreme volume. 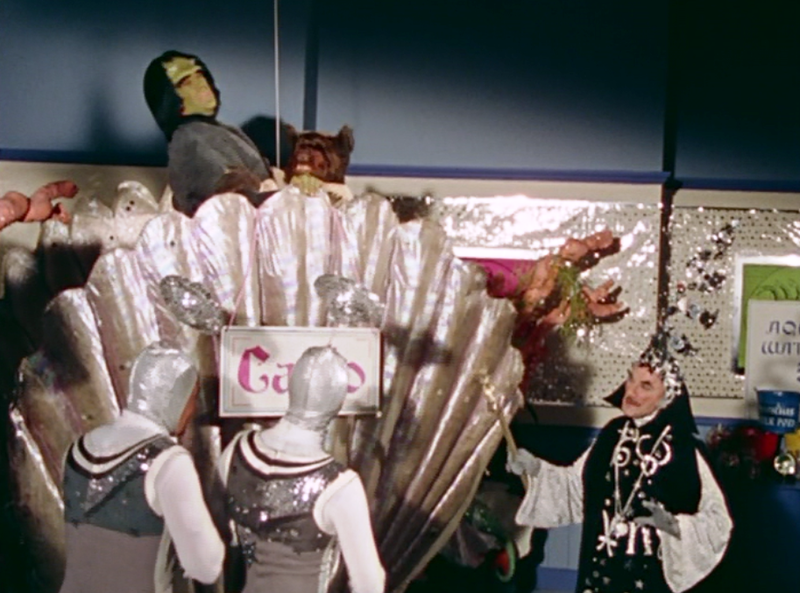 The props and costumes look especially thread-bare this week, with the worst example being the Astrologer’s giant clam, Carlo, which attempts to eat the Frankenstein Monster and the Wolf Man. The clam looks like it is made of poster board. And perhaps I’m missing something, but what, precisely, does a clam have to do with astrology? 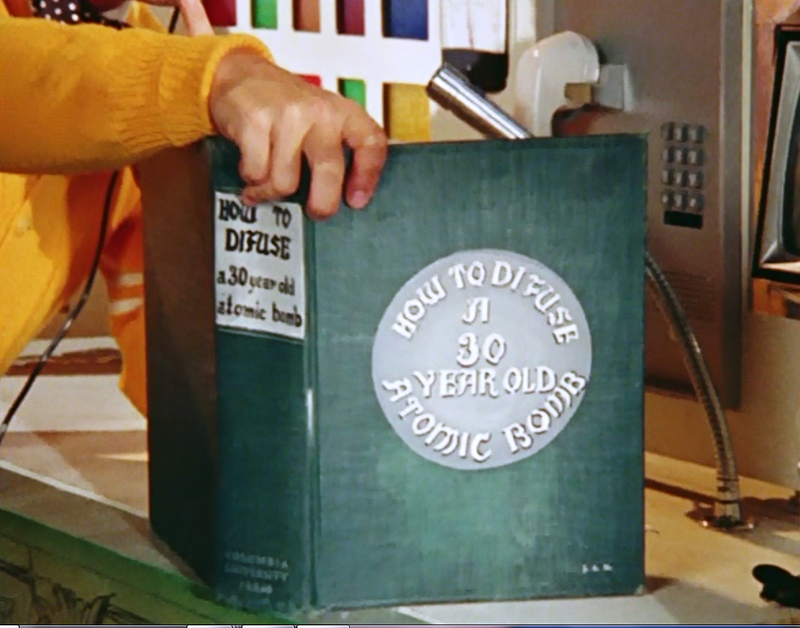 About the only amusing joke of the segment is Walt’s use of a reference book: How to Difuse [sic] a 30 Year Old Atom Bomb, the text by which he instructs Drac how to negate the threat of the week. 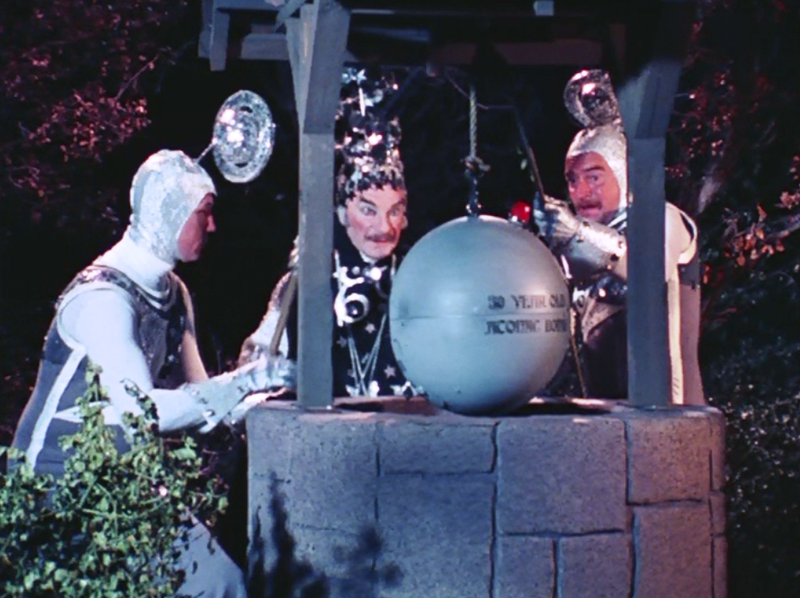 At the end of the episode, Walt reveals that the stolen atom bomb was actually a “dud,” and the same could be said of “The Astrologer,” a shrill, loud half-hour of Monster Squad that had the effect of making my wife leave the room while I was watching it. My new article at Anorak is one I have been meaning to write for some time now. It's all about the conventional wisdom -- and the mistake -- that the characters in Gerry Anderson live-action series are somehow wooden. On the contrary, I find these characters quite realistic, and that is the subject of "Wooden Tops: The Five Best "Real" Characters You Meet" in the works of Mr. Anderson." A VERY long time ago — in the late 1960s — a newspaper critic somewhere wrote what he believed was a witty joke. You see what he did there, right? Gerry and Sylvia Anderson had often worked with puppets on TV series such as Stingray(1964) and Thunderbirds (1965), so this joke was no doubt a clever slam on the actors and writing in the production he was actually reviewing. Even when they weren’t puppets, Anderson characters were about as real as puppets, the joke went. For literally decades now, this joke about “wooden’ characters and performances has been mindlessly regurgitated, and applied to what sometimes seems every Anderson review imaginable. But the question we must now ask is, simply: is the oft-repeated slam actually true? Or is the over-used “wooden” descriptor just a form of conventional wisdom that has gone unquestioned for so long that it has now become mindlessly accepted? To better answer that question, I respectfully submit below the five “real” people you may meet in the live-action productions of Gerry and Sylvia Anderson. I consider “real” (as opposed to “wooden”) to mean in this context that the characters showcase a sense of verisimilitude. They closely resemble people you have encountered and may know in life. Similarly, a “real” person is someone replete with contradictions and failings (rather than just an affectless avatar for “wooden” dialogue or exposition). the surface a bit you find there is something deeper, and maybe even a little conflicted going on inside. In short, this 7th Bond film is tedious and overlong, its narrative is confusing, and the underwhelming American settings -- in Las Vegas -- give the film the appearance of a bad, cheesy TV series of the era. On top of these problems, Connery looks terrible -- overweight and under-groomed -- and seems bored with the proceedings. Diamonds are Forever also lapses into high-camp with the presence of two hired killers who *might* be gay: Mr. Wint and Mr. Kidd. The Roger Moore Era that followed Diamonds are Forever had its own issues to contend with, of course, but Connery’s last outing is undeniably a low-point in the franchise, one equaled only by two other dreadful “last” acts: Moore’s A View to A Kill (1985) and Brosnan’s Die Another Day (2002). 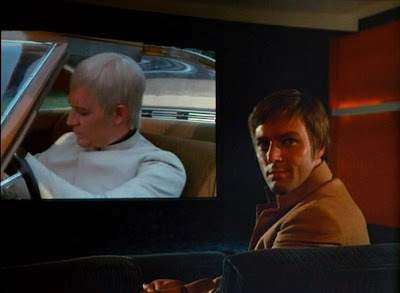 James Bond (Connery), Agent 007, scours the globe for his arch-enemy, S.P.E.C.T.R.E.’s Blofeld (Charles Gray), and when he finds him, kills him with glee. Or so he believes. Sometime later Bond is assigned to a case by his superior at the secret service, M (Lee) that involves a diamond smuggling ring. The investigation takes Bond to Amsterdam, where he meets a beautiful smuggler Tiffany Case (St. John). Bond impersonates another smuggler, Peter Franks, to get close to her. Through an elaborate series of connections, however, Bond soon learns that the diamonds are actually connected to the reclusive American millionaire Willard Whyte (Dean), who lives in a penthouse in Las Vegas. Bond then discovers that the real Willard Whyte is being held captive, and that Blofeld -- having created multiple decoy duplicates of himself including the one Bond killed -- is impersonating the tycoon so as to misuse his fortune. Blofeld’s new plan is to utilize a diamond-ringed, laser-equipped satellite to blackmail the world. Bond pursues Blofeld to his new headquarters, on an oil rig at sea, and with Tiffany’s bumbling help, attempts to stop Blofeld once and for all. Bloated, overlong, and edited with a feeling of lassitude and resignation, Diamonds Are Forever marks James Bond uninspiring entrance into the 1970s, and Sean Connery’s last turn in the iconic role until 1983’s Never Say Never Again. Meandering and labyrinthine, the film suffers from its steadfast refusal to clarify some important points about James Bond’s mission this time around. Specifically, in On Her Majesty’s Secret Service (1969) starring George Lazenby as James Bond, Blofeld (Telly Savalas at that point…) killed Bond’s new wife, Tracy (Diana Rigg) in cold blood. He did it on Bond’s wedding night. 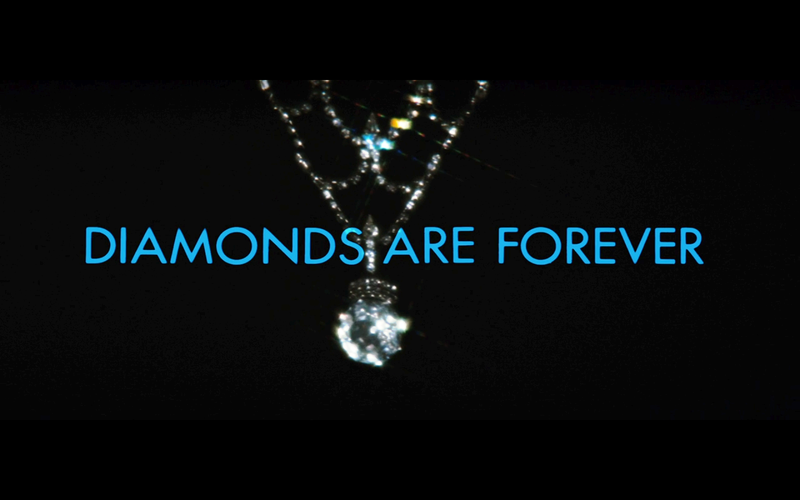 Accordingly, Diamonds Are Forever commences with Bond searching the world for Blofeld, attempting to murder him. Yet Bond never makes any explicit connection -- or any mention whatsoever -- of the events of On Her Majesty’s Secret Service. In other words, the film’s writers expect the audience to make the connection, without making the connection themselves. This way, economically, the film works both for those who did and did not see the Connery-less previous film in the franchise. For example, Bond never says anything here like “this is for Tracy” or something like that. He could be pursuing Blofeld so assiduously for any reason whatsoever. Perhaps he’s just tired of pursuing the super-villain. To sum up the matter briefly: Diamonds are Forever gives us a different actor playing Bond, pursuing a different actor playing Blofeld, and the context of this pursuit is totally unclear. Is On Her Majesty’s Secret Service being ignored and treated as non-canon? Are audiences indeed just supposed “to know” why Bond is angry? Certainly, one would think that in one of Bond’s multiple confrontations with Blofeld in this film, he might mention Tracy by name, or exhibit some kind of personal hatred for Blofeld over the killing of his wife, but it doesn’t really happen. In fact, Bond kills Blofeld (he thinks…) in a mud-bath in the film’s pre-title sequence and then just quips merrily like its old times as the opening song begins. He certainly doesn’t seem driven by personal rage. 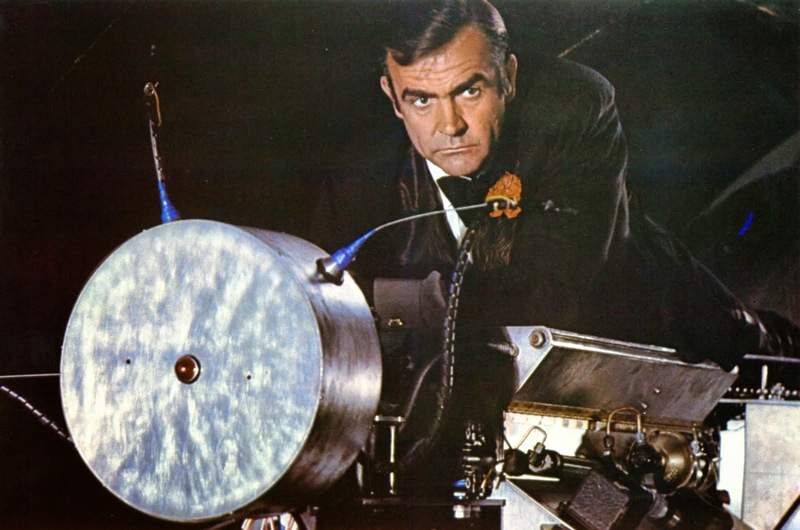 Additionally, Sean Connery looks unkempt, overweight, and bored as hell as James Bond in Diamonds are Forever, and is barely able to muster interest in the convoluted, over-complicated plot-line about stolen diamonds being used as components in a deadly satellite. On top of that, the climactic battle, set atop a real life oil rig, is a debacle from a visual and narrative standpoint. The rig doesn’t crash down into the sea, or explode into shrapnel in the end. Instead plumes of fire shoot up into the air obligingly, in pre-selected spots. Had a miniature been used instead of a real-life rig, the whole thing could have been brought down into the sea with a bit more aplomb. As it stands, this is one of the most uninspiring final battles in all the Bond series. As for Blofeld, Bond shakes him around in his submersible by a crane – an ignominious situation for the villain -- but there is no discernible sense of Blofeld being killed or defeated, or Bond’s revenge quest coming to a meaningful end. Indeed Blofeld -- unnamed as such -- shows up alive in 1981’s For Your Eyes Only, but at least that film has the decency to name-check Tracy (on her tombstone) on the anniversary of her death. At least there, we understand why Bond is after revenge. 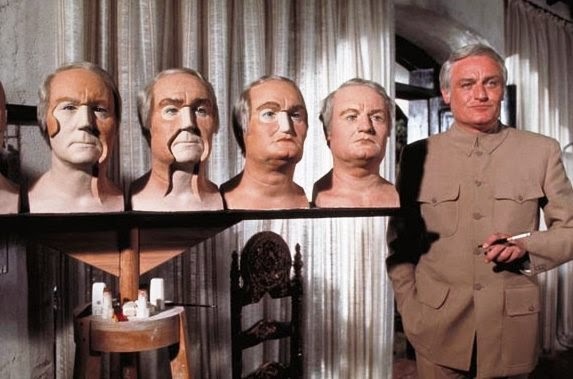 Finally, one last note involving Blofeld: Charles Gray plays the least satisfactory, least-menacing version of the character ever seen. Donald Pleasence remains the best, in my opinion, though I also like Savalas’s more brutish rendition of the villain. The science fiction aspects of Diamonds are Forever involve the aforementioned satellite and its death ray capability. 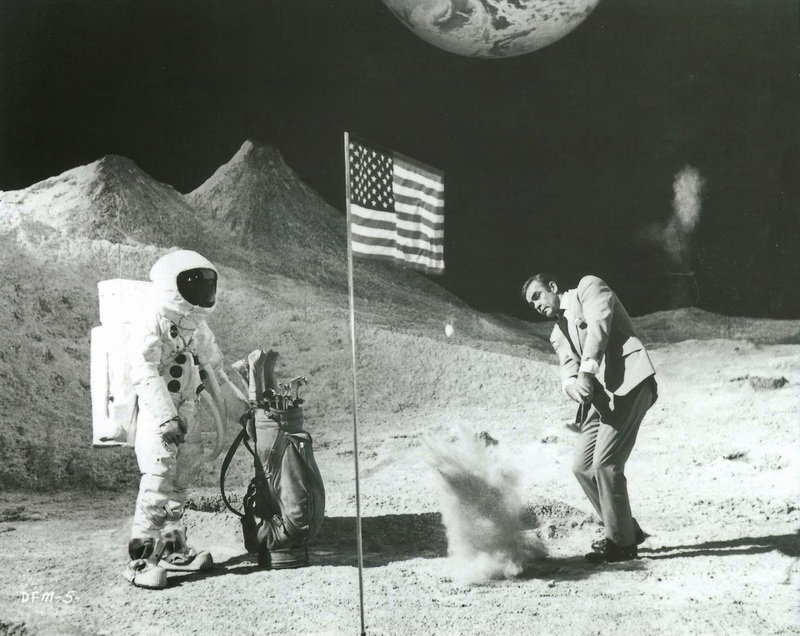 Accordingly, one of the most enjoyable aspects of the film finds Bond infiltrating Willard Whyte’s subterranean space program facility, wandering onto a recreation of the lunar surface, and then stealing a lunar buggy for an extended chase across the desert. The chase scene is undeniably fun, if not exactly exciting, but even in this enjoyable sequence there are questions to be asked. Like: why do men in space suits move around in slow motion on the mock lunar surface, even though it is just a training exercise? Still, I must give Diamonds are Forever its due. Outside of the space age plot, this Bond film also features one of the best fight sequences in the entire Bond cycle. Specifically, 007 goes up against jewel smuggler Peter Franks (Joe Robinson) in an extremely tight setting: a cramped elevator compartment. The setting is so tight, actually, that almost each time a character pulls back to deliver a punch, an elbow shatters glass on the windows or hits a button, accidentally making the doors open and close, and the elevator rise and fall. This unpredictable fight scene features broken light bulbs and shattered glass panes, and at one point Franks picks up a shard of jagged glass and attempts to stab Bond with it. 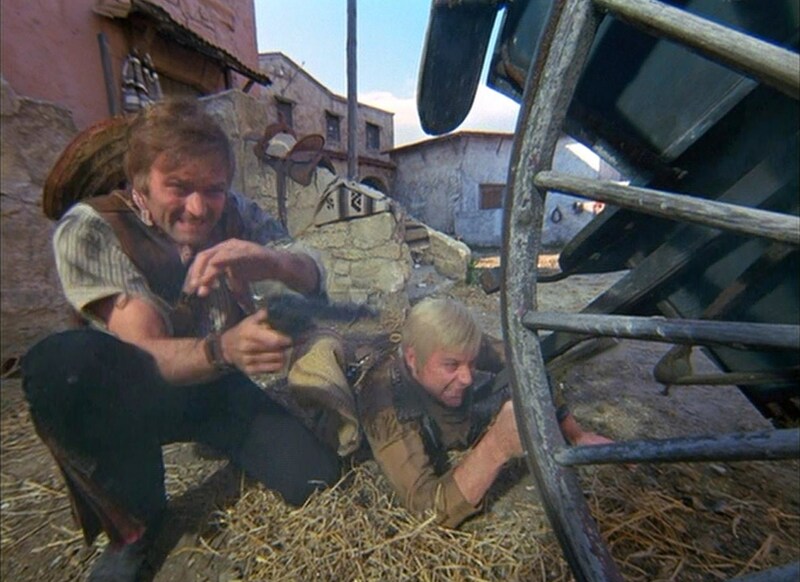 There isn’t a lot of quick cutting during this scene or much change in camera position or angle, just two men -- Connery and Robinson (and their stunt-men no doubt) -- slugging it out brutally, sometimes for long stretches. This is one of the meanest, most down-and-dirty hand-to-hand grudge matches in the long-lived franchise, and one of the best. I wish it had come to the screen in a better film. A fight like this belongs in a much better Bond film, and is an out-of-step high-point in what seems a listless and life-less entry. My new article at Anorak is now up. It gazes at the Exorcist (1973) craze of the mid-1970s, and five films that exploited it to strong effect. WILLIAM Friedkin’s The Exorcist — based on the best-selling novel by William Peter Blatty — quickly became one of the first genre blockbusters of the seventies, and a generational touchstone to boot. The Exorcist also represented a new brand of horror film, in a sense, because it lacked a familiar “monster” like Dracula, the Wolf Man or The Frankenstein Monster, and it didn’t depend on well-known genre personalities, like Vincent Price, Christopher Lee, or Peter Cushing, either. Accordingly, lines stretched around the block for showings of the horror film on the East and West coasts in America, and everyone seemed to have a very strong opinion about the controversial film, pro or con. Graham’s publicly-expressed fear was that there would be even more psychological damage to Americans if people continued to “flock to the box office” to see The Exorcist. But while such self-appointed protectors of morality wrung their hands over Friedkin’s masterpiece and its public acceptance, Hollywood filmmakers realized that a large audience was now primed for much more of The Exorcist’s brand of terror. Specifically, this brand of horror consisted of “normal” Americans unexpectedly encountering the supernatural and/or paranormal, and in the process facing questions of the after-life, and the existence of God…or the Devil. 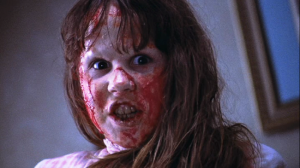 In the span of a few short years, movie audiences were treated to Exorcist imitations such as Abby (1974), Beyond the Door (1975), The Devil’s Rain (1975), Race with the Devil(1975), The Reincarnation of Peter Proud (1975), The Haunting of Julia (1976), Ruby(1977), and The Legacy (1979). 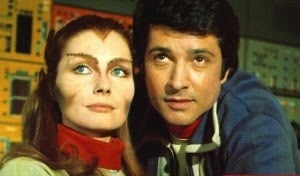 Cult-TV Flashback: UFO (1969 - 1970): "Mindbender"
By its very nature, science fiction television is a milieu for diligently exploring other realities. Those "other" realities could include a starship exploring alien worlds in the 23rd century, or a mysterious island in the Pacific, where plane crash survivors toil. Yet, over the years, some notable installments of science fiction TV series have also occasionally crossed paths with our kitchen-sink reality, right here. In this type of story, the fourth wall gets shattered...and shattered good. The imaginary world of the characters suddenly overlaps with the real world of the filmmaker or the writer. These mind-blowing tales thus ask (and demand...) that the regular audience suddenly view the familiar "universe" or canon of a sci-fi series in a different and often challenging way. In other words, viewers are asked to recognize the artifice of storytelling, or even of movie-making. One of the earliest examples of this genre trope came in 1960, in the first season of Rod Serling's anthology, The Twilight Zone. In the episode "A World of Difference" a business executive, Arthur Curtis (Howard Duff) discovers he's not really in his office taking business calls...he's on a movie set. He's an actor playing a part. Reality has shifted like sand beneath his feet. His memories of a wife -- of a life itself -- are nothing more than manifestations of a writer's imagination; of a script. Rod Serling returned to the same theme in Night Gallery, in November of 1971. In "Midnight Never Ends," a hitchhiking soldier comes to realize he's just a character trapped in a bad, in-progress story; just a cog in the inner workings of a writer's machine. He can even hear -- from somewhere high up above -- the keys of a typewriter pounding away. In 1998, Star Trek: Deep Space Nine featured a variation on this tale. Captain Benjamin Sisko (Avery Brooks) in "Far Beyond the Stars" hallucinates that he's a pulp science fiction author in 1950s America. As a man named Benny, he writes a science fiction saga about a futuristic space station...and an African-American captain. All those people around him think the story is great, but worry that America isn't ready yet to believe in or accept a black star ship captain. So the question becomes: is Sisko that future captain, living in the 24th century? Or is he but a frustrated, delusional writer of the Eisenhower decade...imagining a better tomorrow? 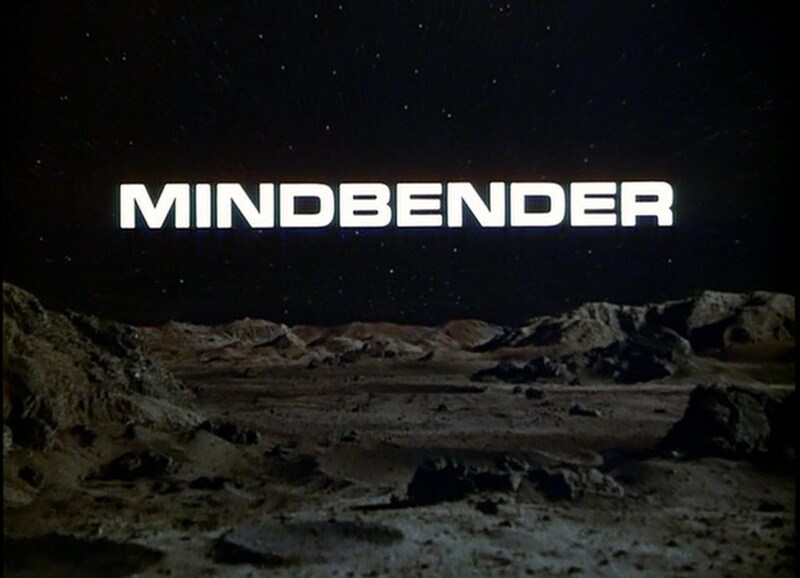 Astronaut Conroy discovers a strange moon rock in "Mindbender"
One of the most stylish examples of this self-reflexive story -- a story which finds characters in the drama becoming active participants not in a narrative, but in the "creation" of the drama -- is "Mindbender," from Gerry Anderson's UFO. This segment originally aired on CBS in 1971, and was written by Tony Barwick. As you may recall, UFO is set in the far flung, future year of 1980. The series depicts the on-going battle between Earth forces under the umbrella S.H.A.D.O. (Supreme Headquarters Alien Defense Organization) and nefarious aliens from a dying world; aliens bent on harvesting human organs as replacement parts. 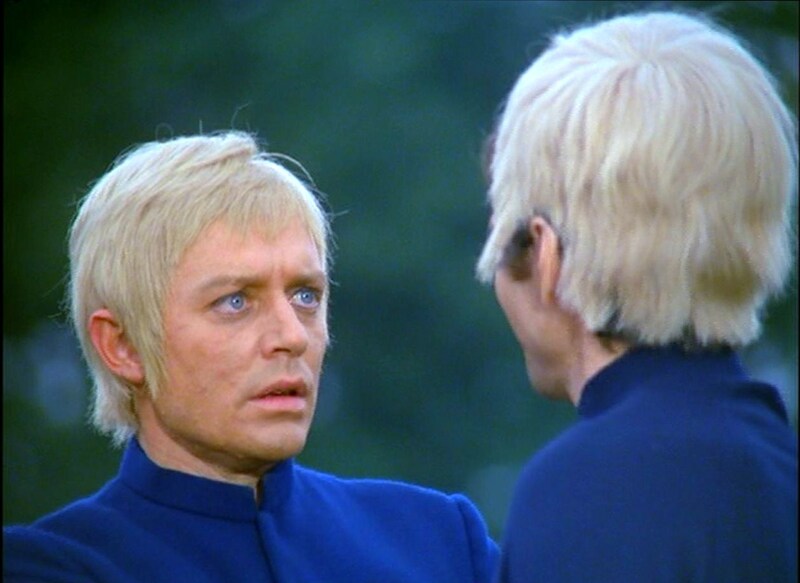 The stalwart hero of the series, Commander Ed Straker (Ed Bishop) is a tough-as-nails combatant. With a punk haircut -- and universally adorning a stylish Nehru jacket -- Straker commands S.H.A.D.O. from the cover of a bustling movie studio. Wanda Ventham had joined the cast as Straker's gorgeous number 2 at S.H.A.D.O, Colonel Virginia Lake, and the final shows feature some great, amusing banter between Straker, Lake and Michael Billington's Paul Foster, a pilot working for the organization. In terms of narratives, late-era UFO episodes deal persuasively with the drug/hippie culture ("The Long Sleep"), and even bend and freeze time itself ("Timelash"). 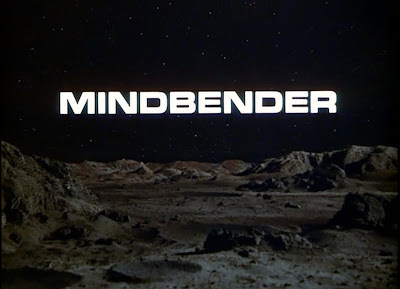 In the imaginatively-conceived "Mindbender," an attacking UFO explodes over the lunar surface, just four miles from S.H.A.D.O. 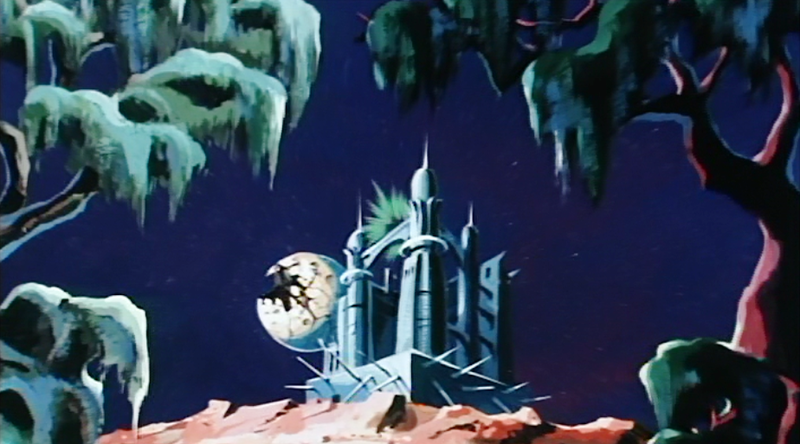 's moon base. 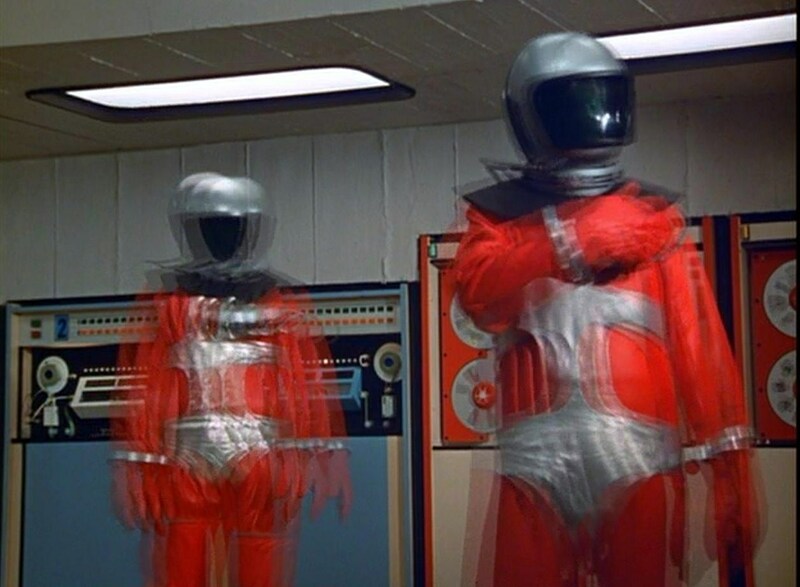 Straker and Foster travel to the moon to investigate. 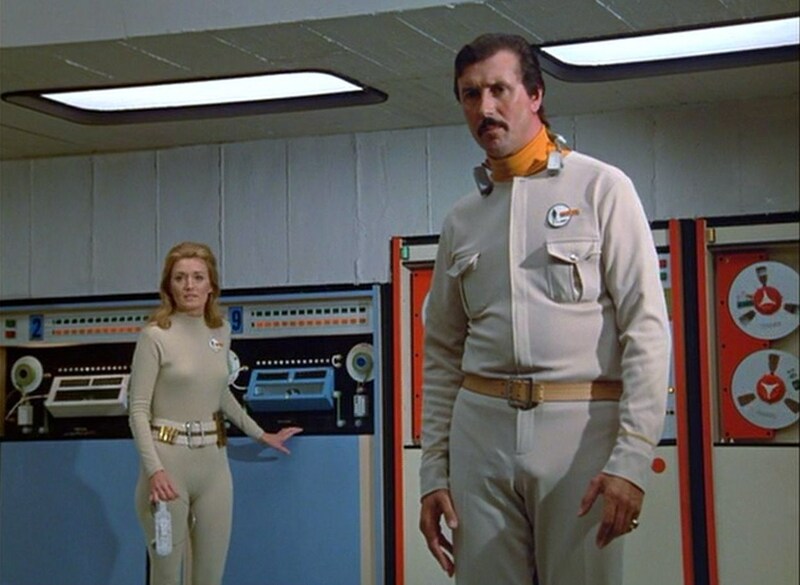 Leone meets Kubrick, Gerry Anderson-style. Astronaut Andy Conroy, an amateur author of Westerns, recovers a strange translucent rock from the spaceship wreckage, and very soon loses his grip on reality. 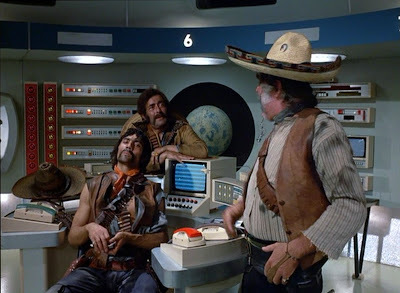 Specifically, Conroy begins to envision his comrades on Moon Base, including Nina Barry (Dolores Mantez) as dangerous, gun-toting Mexican bandits straight out of a Sergio Leone spaghetti western. Commendably, Conroy's western-style hallucination is visualized by episode director Ken Turner as a deliberate tribute to the famous "Man with No Name" films of Leone and Clint Eastwood. The musical score lovingly evokes Ennio Morricone's famous work...almost down to a note. And stylistically and physically the episode apes efforts such as A Fistful of Dollars (1964) and For a Few Dollars More (1965). For instance, Turner repeatedly cuts to extreme close-ups of Conroy's steely eyes, a staple of these great 1960s westerns. 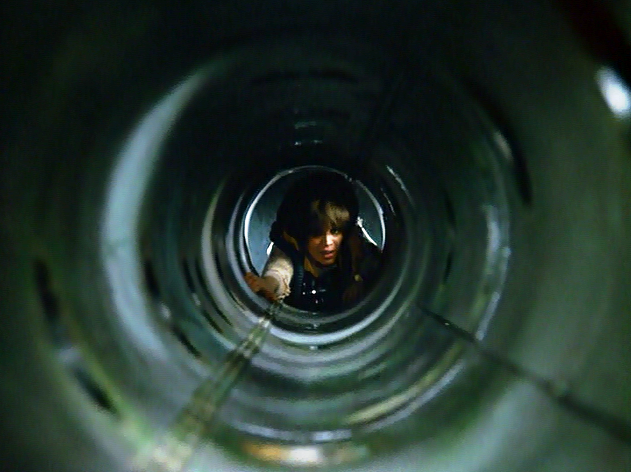 Additional shots feature grungy, grinning bandits with bad teeth and other highly-unpleasant physical characteristics. In other words, these phantasm individuals are purposefully exaggerated in the familiar spaghetti western mode too. The episode likewise deploys fish-eye lenses at points, and utilizes slow-motion photography for explosive shoot-out moments. I might add, this sort of anachronistic visualization is the last thing you would expect in the gadgetry-heavy, artificial future world of UFO. It's a jarring conjunction of primitive and futuristic, and is appropriately "strange" and hallucinatory, well in keeping with the episode's narrative. After Conroy's death on Moon base, the offending moon rock gets transferred to S.H.A.D.O. headquarters on Earth, located under the movie studio. There, Captain James, another veteran astronaut, is exposed and also quickly goes insane. He "sees" all of his co-workers as uniformed aliens and, like Conroy before him, goes on a paranoid shooting spree. 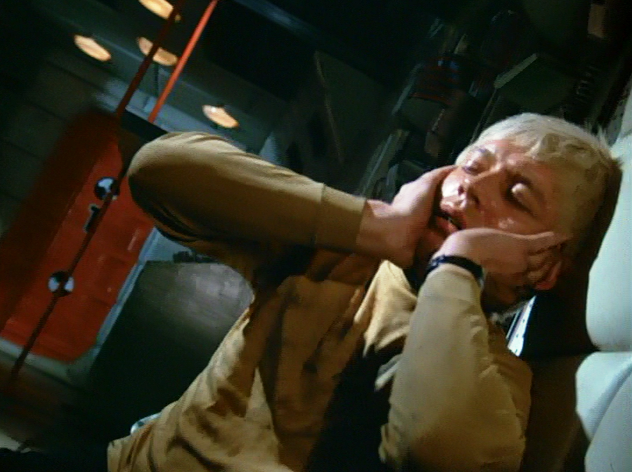 He abducts Colonel Lake, attempts to kill Straker, and is eventually subdued. But the mystery deepens. What is going on? Soon, Straker learns the answer for himself. In his office, he comes in contact with the offending alien rock. During an intense argument with bureaucratic, dollar-pinching General Henderson (Grant Taylor) Straker begins to lose his steely composure and grip on sanity. "Let's get back to realities," Henderson argues, yelling at Straker. And then -- just as his temper boils over -- Straker hears a voice (from somewhere off-screen...) yell "Cut" and "Print." Suddenly, a film crew descends upon him and begins calling him Howard Byrne...the name of an actor on the movie studio where Straker works. Straker wanders out of his office...only to see that it is a TV show set surrounded by lights, cameras and other filmmaking paraphernalia. 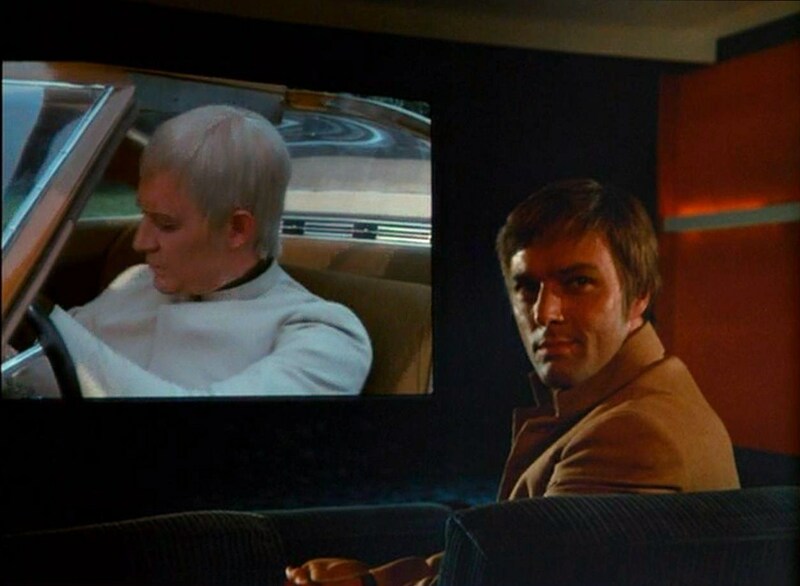 Confused, he heads out to the studio grounds and actually runs smack into his stand-in (Stuart Damon), who is even wearing a white wig, mimicking his distinctive hair-style. 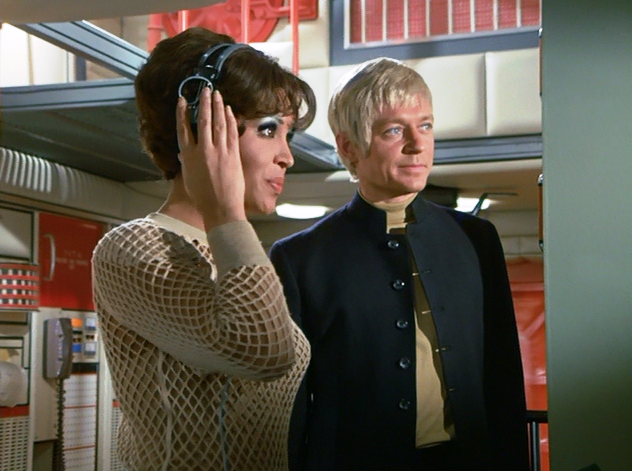 Soon, the confused Straker is ordered to report to Theater 7, where the rushes of his "show" are about to begin. Straker obediently sits down in an auditorium and the footage commences. He watches as footage from the pilot episode of the series, "Identified," plays on the screen before him. After this sequence, Straker watches in torturous paralysis the death of his young son, Johnny...all material from another previous episode, "A Question of Priorities." Face to face with a stand-in. Paul Foster then sits down next to Straker, calling himself "Mike" (Michael Billington), and notes that this traumatic material will "make a great episode." 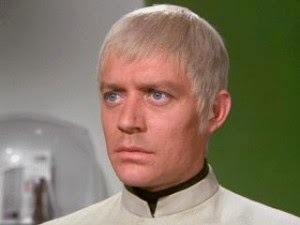 An emotionally-affected Straker, forced again to countenance his myriad personal failures (a recurring theme of the series in episodes such as "Confetti Check A-OK" and "A Question of Priorities"), objects. "That's my life! That's my son!" 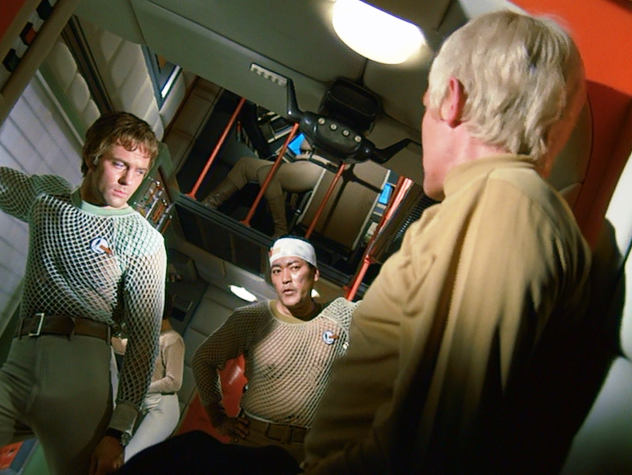 But soon, the ever-rational, ever-resilient Straker realizes that he has been adversely affected by an alien "booby trap," one "aimed at the mind." He understands that to get back to his world, his reality, he must focus. General Henderson has already informed him that he has a "monkey on his back," called "dedication." Now he must tap into that dedication. 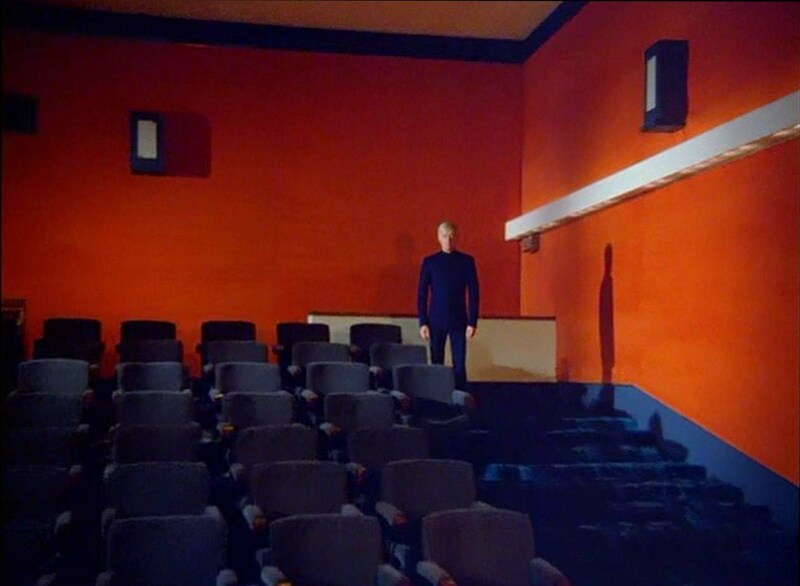 Isolation and alienation in the auditorium. Straker returns to HQ to "play" the scene with General Henderson over again. After a rapid, highly cinematic pull-back away from Straker depicting our protagonist as but one of many working actors on the studio lot, we get back to "realities," as Henderson puts it. With dedication and concentration, Straker recites his "dialogue." He gets back in "the moment." The longer he goes on, the more that Straker's reality reasserts itself. The film crew transforms before our eyes -- in almost iconic composition -- into the courageous men and women of S.H.A.D.O. The walls re-form -- the fourth wall re-established -- and Straker is home, at last. I admire how "Mindbender" works so well on two levels. On one level is the literal narrative: the story of an alien "booby trap" confusing the minds of S.H.A.D.O. 's best and brightest. On another, more metaphorical level, the subject here is film itself; how sometimes we replay events in our lives as if they're old movies. We see this in Conroy's subplot, as he imagines himself a cowboy. And we see it -- tragically -- with Straker, as he is forced to relive all his personal pain on the silver screen. Straker strenuously objects to the idea that movie makers would steal his life and his memories and "put them up on the screen" for the entertainment of others...but that's what the art-form always does. It takes from real life...and not always in a pleasant way. Tragedy, regret, pathos...they all make a "great episode," don't they? "This will make a great episode..."
"Mindbender" also gets at the fragility of the whole process of filmmaking, of the whole illusion, in some clever way. Every week, we tune into a show like Star Trek or UFO and willfully suspend our disbelief. We know we are watching actors and special effects, a filmed entertainment with a pre-determined outcome and an emotion-provoking musical track. And yet with our whole minds (and our whole hearts...) we dupe ourselves into believing, after a fashion, that what we are seeing is "real;" that these characters truly "exist." UFO playfully blows the lid off that carefully constructed folie-en-famille, revealing to the audience not pilot Paul Foster, but actor Mike Billington; pulling back on high-angle shots of Moon base, Skydiver, and Straker's office and deliberately showing us that these environs are all carefully-constructed sets...merely artifice. This is a high-wire act, be certain. The curtain is pulled back and the truth revealed, but in a science fiction series like UFO, there's no guarantee that once revealed, the magic can be restored. Yet it is, most definitively, restored, by "Mindbender's" conclusion. As viewers, we greet Straker's escape from our reality back to his world as a huge relief. We breathe easy again. He escapes into fantasy, in one sense, as perhaps we might like to do. The walls of suspension of disbelief are, again, erected...and we sneak back in, along with Straker. We're back in the drama, back in the shared delusion or dream. "Mindbender" plays beautifully with form and anticipates our every reaction. The magician reveals -- at least briefly -- his hand, and then it's back to fashioning the magic again. And in shows like "A World of Difference," "Midnight Never Ends," "Far Beyond the Stars" and "Mindbender," the artist not only tells us a story; he invites us inside the process to take a nuts-and-bolts look at how that story gets delivered to us; at the ways the artistic mind conjures up the illusions of another world, another reality. This kind of story can be done and has been done many times as a self-referential joke...a lark. But sometimes -- when it is vetted so brilliantly (as is the case on UFO) -- this long-standing genre convention makes us ask important questions about what is real life and what is fantasy. More than that, it asks us to consider, perhaps, the reasons that we flock so readily and easily to the fantasy. 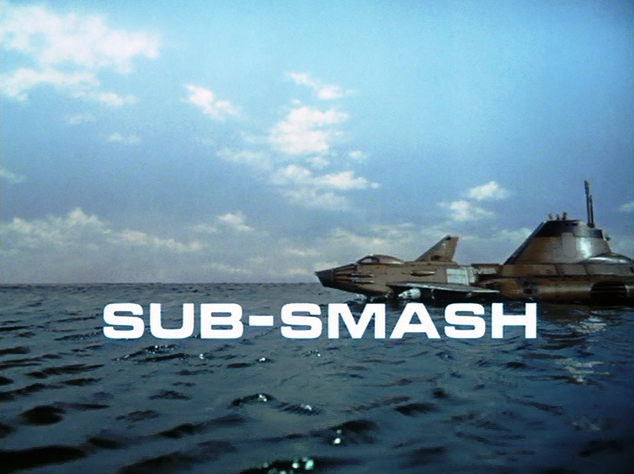 Cult-TV Flashback: UFO (1969 - 1970): "Sub Smash"
I know Straker’s words are true in my own, personal experience. When I was twenty or so I went about my way feeling invincible and immortal most of the time. Now, as a husband and a father in my mid-40s, I can readily detect how much I have to lose, and how amazing the gift of life really is. 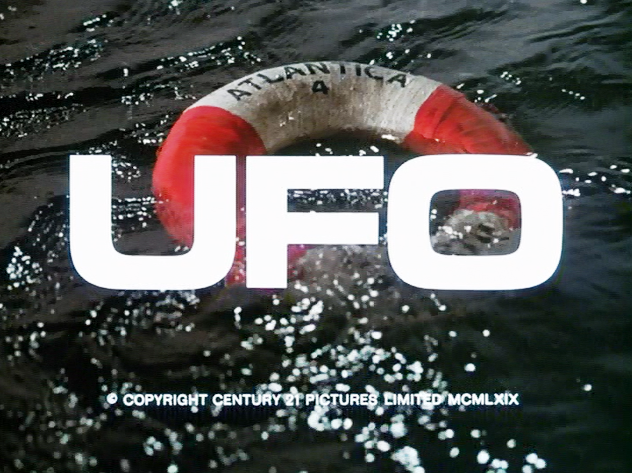 In my review of “Confetti Check A-OK,” I mentioned the beautiful and expressive cinematography of UFO. You can see that quality again here, in “Sub Smash,” though it is deployed for less-sensitive and perhaps more sadistic purposes. That’s how Straker grapples with being stranded in a sinking ship (a metaphor for his personal life?) and how he grabs a life raft to the future, one might even say. 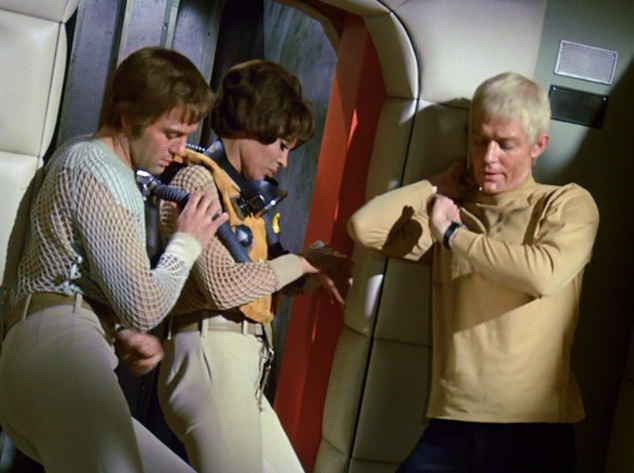 There’s someone to rescue today -- Nina Barry -- and that task gets Commander Ed Straker to tomorrow.